4D Technology presented this webinar discussing improved methods and technologies for high resolution, shop-floor surface defect measurement on Tuesday, July 18, 2017. Registration is closed for the webinar. Accurate measurement of surface defects is essential to the long life and performance of precision components for aerospace, automotive, and other applications. The challenge facing inspectors is how to quantify pits, scratches, bumps, etc., with sufficient resolution, coverage and speed to satisfy customer requirements—particularly on complex surfaces or on large components. In this webinar we will discuss the challenges involved in making accurate surface defect measurements. 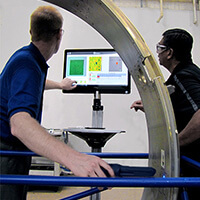 Kevin Harding, President of Optical Metrology Solutions, (recently retired as GE Research Principal Scientist), will discuss the strengths and shortcomings of common measurement techniques, ranging from a “calibrated fingernail” to high-end 3D surface profilers. Dr. Erik Novak of 4D Technology Corporation will present the 4D InSpec Surface Gauge, the first handheld, precision instrument for non-contact, 3D surface defect measurement. Developed in conjunction with major aerospace and precision machining companies, the handheld 4D InSpec measures defects from 0.1 to 100 mils deep, even in difficult part locations, with measurement times of a few seconds and instant results and reporting. Examples from new-make and repair/rework facilities will be presented in which the new gauge has been used to dramatically reduce measurement cycle time, decrease the rate of rework due to false-positive measurements, and improve the traceability and reliability of surface defect measurement results.